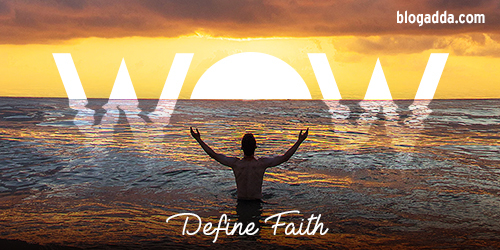 Write Over The Weekend - Define Faith. What Does It Mean To You? When was the last time you did something that you had never done before? How did you manage to do it? Faith. Did it work? Yes, maybe. Does it work always? Well, mostly. How did you feel then? This weekend, we want you to ‘Define Faith‘. What does it mean to you? Tell us about the things that you did basis Faith. Share with us all the stories on what choices you had and what happened after. Some say that if you lose faith on something, it is almost impossible to regain. What is your experience? We look forward to your stories. We love the perspectives you bring in and wait to read your posts. Kindly ensure that you publish and submit them before Sunday midnight and win yourself a chance to display the WOW badge on your blog and social networks. There are a lot of readers that read your post. Kindly add this line in your blogpost, ‘This post is a part of Write Over the Weekend, an initiative for Indian Bloggers by BlogAdda.’ Click on the submit button below to submit your WOW entry. Discover something new this summer. Happy Gudi Padwa in advance! Have fun. Hope this is acceptable as my new blog link is still under approval.